Enyimba 2-0 Shooting: Abu and Joe to the rescue. So we can actually win a team by more than one goal. Nice. The threat of former coach Kadiri Ikhana and his Shooting Stars ended up a somewhat easy 2-0 win. Good morning everyone by the way. Abu Azeez netted his first goal for us in his first start for us and Osadiaye made it three goals in as many matches for us hitting home the second with just seconds left to play. Ikechukwu Ibenegbu also had a stormer as did the rest of the guys. 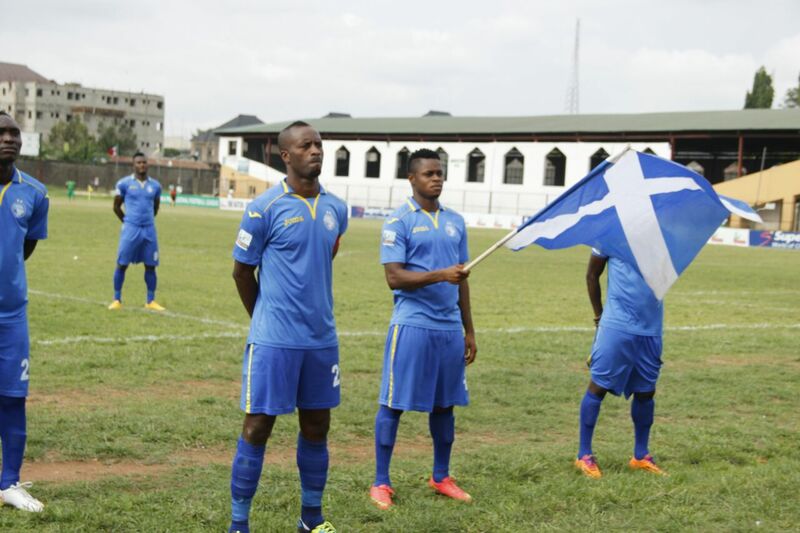 Evidently Shooting Stars are pretty much toothless away from home – I’d seen FC Ifeanyi Ubah fire three first half goals against them only a few weeks ago but against us, in that wonderful Abia Warriors turf, I was concerned things might go southwards. I wasn’t able to see the game having been sent on official duty yesterday morning but I followed the updates via @LMCNPFL and @EnyimbaFC and the longer it dragged on before we got the opener, I whispered to the person with me, I’ll take the Ikorodu or Plateau United scoreline. Saturday night, just before we played Rangers, @EnyimbaEnyi ranted on Twitter on the need for the Abu Azeez of Warri Wolves that tormented us in Warri last year to show us his true colours. Truth is he’s had very little action since he joined. I think this should be his second or third appearance for us and being paired with Pyagbara looked threatening in the absence of Najare and Chukwude. I also remember that the rant suggested perhaps he had a hattrick in stock for us when eventually he sees action but last night he scored one, the opener and it was priceless. If you remember our records against the likes of Giwa FC in our home games with them then you surely are likely to understand how important scoring early in a home game is. The longer you go without scoring, the more your opponents grow in confidence. It looked headed for a third straight 1-0 home win until Mfon and Osadiaye conspired to get our second. Aside the fact that Ezekiel Bassey was stretched out with an injury the rest of the game was largely uneventful. What it meant is we move out of the bottom three and we have three more rearranged fixtures as we continue our ascent. We have one with Pillars, Sunshine Stars and Heartland as outstanding games and the more the team keeps improving, the readier we will be for those fixtures. I did get to see that penalty shout vs Rangers yesterday. Trust me, the more you looked at it the more hardly done by you’d feel. But that’s football and such things happen. You could see the penalty on the twitter handle of my friend Solace Chukwu. @TheOddSolace. Scroll down his time line and you’d see the video clip. It could spoil your mood so I advice you could avoid doing that totally. I still think the team and Management are not given as much credit as they deserve because of the kind of season’s start we had. In time I remain confident we will come good and our insatiable fans can feel proud again. The LMC has sanctioned some clubs… You must have heard… Perhaps we can look at all that tomorrow. I know this may not be the vintage blog post you’re used to but you see, my body aches and I think I could use like two or three hours of uninterrupted sleep right now, abeg no be me kill Jesus. Next postDon’t be like them.